IN 2015, Erin Short and her partner James Owen went on an epic Aussie road trip. The English-born couple were relocating from Melbourne to Queensland's Sunshine Coast, and decided to take the opportunity to tour Australia en route with their Instagram-worthy campervan. But during the entire trip, their van was continually the envy of other campers - and a business idea was born. "On the way we received a lot of compliments, with people asking if we rented it or if we had paid someone to convert it," Ms Short explained. "It was noticeably different to other vans in the campsites we stayed in, so we considered the option of renting our van out." In October 2017, the couple started renting out their custom-made van on Camplify, a popular caravan hire and RV sharing community. They went on to set up their own small side business, Drifters Campervans, and they now have two vans in their fleet. Both have regular full-time jobs - Ms Short, 30, is a freelance graphic designer, while Mr Owen, 31, works in management. But the duo are also raking in around $18,000 a year from their part-time business. The couple plan on growing the company and expanding their fleet, and are also saving for a deposit for their own home. 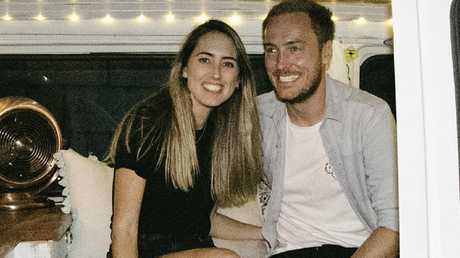 The pair began listing their first van on Camplify in October 2017, and they had their first booking within a few days. It then quickly booked out over the entire Christmas period, and was booked for every weekend during the peak summer period over January and February. "Every weekend was booked, which was awesome," Ms Short said. "It's been more successful than we initially thought it might be. We thought it would take a while to build up, but the feedback has been good." Ms Short said she believed tourists and locals had been crying out for a service like theirs for some time. "There was a hole in the market - we found on our road trip that a lot of campervans are aimed at backpackers with garish graphics, ones you wouldn't want to be seen in," she said. "And at the other end of the scale there's souped-up RVs aimed at grey nomads who might have a higher disposable income, so they are like a house on wheels. "We found there was nothing in the middle for younger people. These days people are so aware of aesthetics - with stuff like Instagram and Pinterest, everybody knows what they like. "We're about design and function, rather than just one or the other." Mr Owen said one of the reasons for their success has been the all-inclusive, personalised service. Unlike some of their competitors, bookings include everything such as bedding, an awning and hammock, a coffee maker, roadside assistance and insurance and even a case of beer if customers book for a certain number of nights thanks to a partnership with Stone & Wood Brewing Company. "People appreciate those little extras," he said. Ms Short said she loved helping people create memories. "One couple flew from interstate to rent our van to visit Hervey Bay and he surprised her half way through the trip, which was very cute," Ms Short said. "We also get quite a few girls booking a van for a surprise birthday trip for their partner." She said van rental was becoming more and more popular. "Based on our experience I think it's especially popular on the Sunshine Coast as people want to go exploring and get away from the nine-to-five daily grind," she said. "And things like Airbnb and Airtasker have made people more aware of the sharing economy so now the concept of renting someone else's van isn't so alien." New research by start-up accelerator The Sharing Hub has found seven million Australians - or 36 per cent of the population - have used the sharing economy at some point to make money on the side. That figure is expected to rise to up to 54 per cent by the end of the year. At the moment, one in 10 of us are supplying the sharing economy, working an average of five hours a week and earning $1100 a month on top of their regular job. The extra money is most likely to be put towards paying bills, rent or mortgage, debt, and saving to buy a property, with some even using it to plan for early retirement. Besides Uber and Airbnb, a number of homegrown platforms are also contributing to Australia's $2.6 billion sharing economy. Suppliers using Airtasker, for example, earn up to $5000 a month, while those signed up to pet sitting service Mad Paws can make up to $1300 a month. Courier service Zoom2u can net workers $8500 a month, while Camplify can earn van owners $9000 a month. Storage space platform Spacer allows Aussies to earn around $350 a month while hiring out your stuff on Openshed can make $250 extra a month.